Get your staff in the field and in the office on the same page! 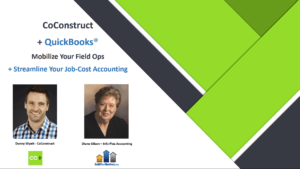 Learn how QuickBooks and CoConstruct can be structured to use a “NED2 (Never Enter Data Twice)” approach to create useful, and critical, job-cost reports. Benefits: Save time and money. Need to gain more financial control over each and every job? 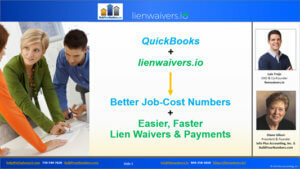 Learn how QuickBooks + lienwaivers.io can be integrated to provide critical job-costing information as well as speedier cash-flow. 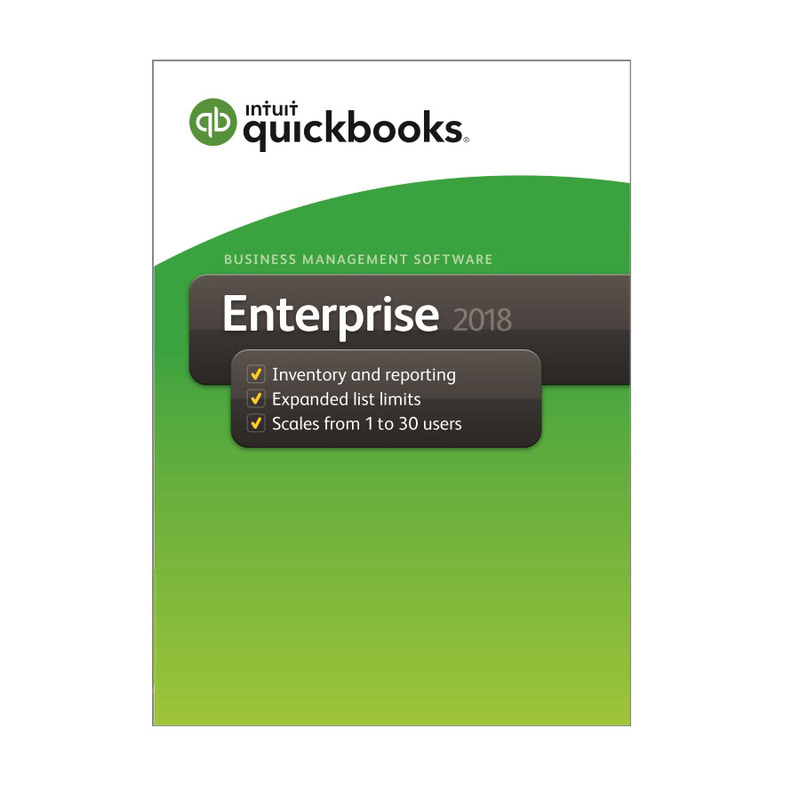 Learn how to easily use QuickBooks management reports to transform your company and how to view your profitability through QuickBooks Estimates, Job-Costing & Variance Reports. 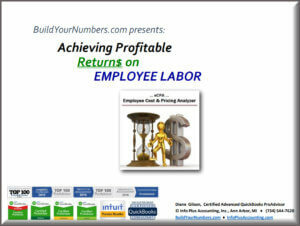 Why you should care about your true costs of labor? 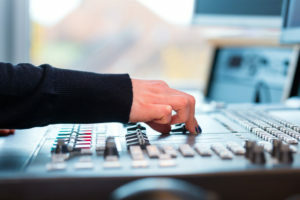 If you're not sure, take a peek at this webinar to explain how to price labor to get the gross profit percentage and dollars you need. Learn why you should track true labor costs for each and every job. Benefits: More accurately calculate labor costs on each job. 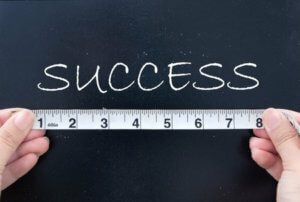 Having issues holding employees accountable for reducing errors and meeting goals? 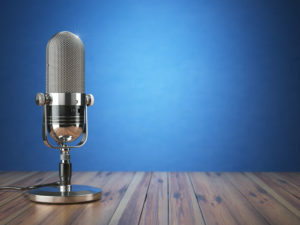 From our "Better Numbers Better Business" series, this webinar provides some insight into how to convey specific goals to employees for jobs and tasks and how to measure the results. Benefits: Get more value out of every employee. Need some help reorganizing your chart of accounts? Learn how your accounts need to be organized in a way that shows income, cost of goods sold, and company overhead. 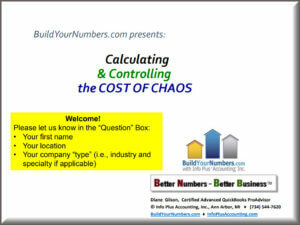 Get the right information by creating account headers, groups, subtotals, and adding percentages. Benefit: Get better, more usable information from your reporting. QuickBooks items allow construction businesses to track, report on, and ultimately get the financial detail they need on all of their jobs. Simplify your accounting and bookkeeping, save time and money, and get the reporting you need to run a more profitable business. Benefits: Create the most effective items list for your construction company. QuickBooks Online has its advantages and disadvantages compared to Desktop. 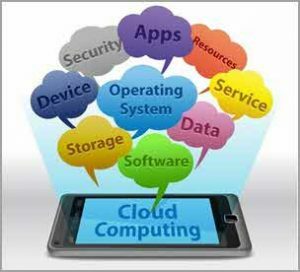 Explore why construction, manufacturing and service business may want to stay away from moving to the cloud (for the time being). Benefits: Find the version of QuickBooks that's right for your company. Failing to plan, track and monitor key financial results can seriously impact a company's financial future. 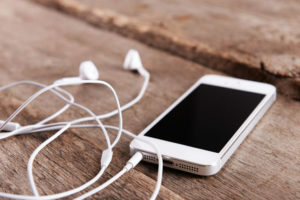 This story is designed to show how different companies handle their numbers and operations. 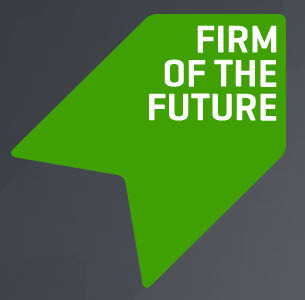 Benefits: Quickly identify the right and wrong ways to run a construction business. 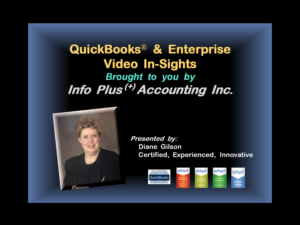 If you've ever wondered how to figure out who made an entry in QuickBooks and on which date, this video is the one for you! 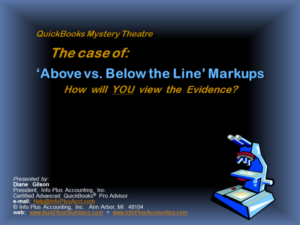 A little detective work can get you the background information you need within your accounting system. 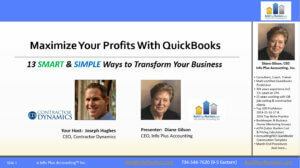 Benefits: Get more detail out of your QuickBooks transactions and reports. Find out the most optimal arrangement for your chart of accounts by watching this short video. 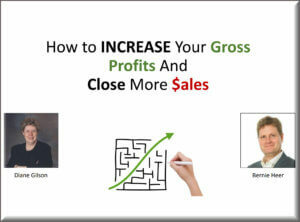 A few changes can have a drastic impact on your gross profit percentage. Benefits: Get more accurate reporting by modifying your chart of accounts. Have you ever wondered why your bank accounts don't reflect the profit you see in your financial statements? 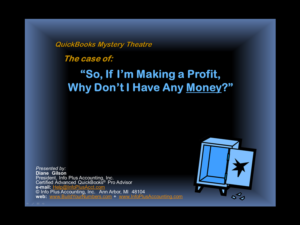 You can utilize a few reports in QuickBooks to help you figure out why your ending cash balance differs from your profits. 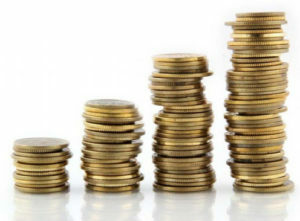 Benefits: See exactly how profits track through to your current cash position. 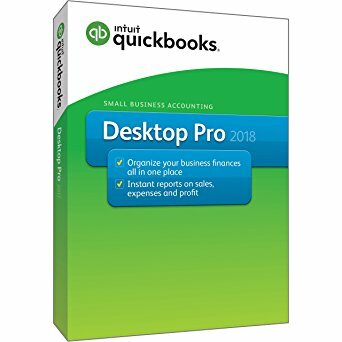 Save AT LEAST 35% off standard retail pricing when you order QuickBooks Desktop Pro through us. We're Intuit Solution Providers and we'll pass the savings onto you! Benefits: QuickBooks can help you get accurate job-cost reports and we'll get you set-up with the right version at a discount. 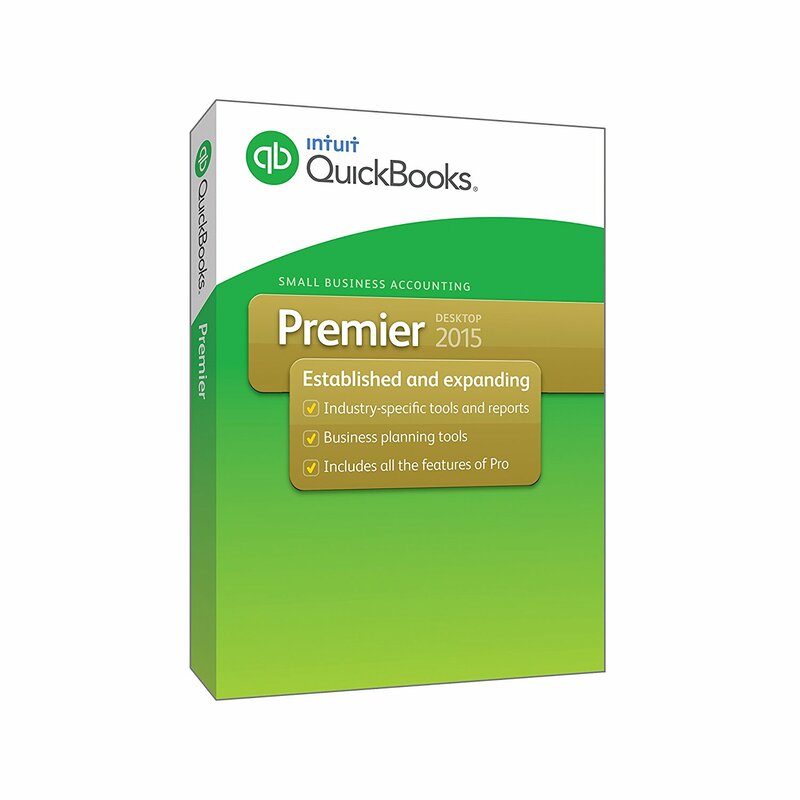 Save AT LEAST 35% off standard retail pricing when you order QuickBooks Desktop Premier through us. We're Intuit Solution Providers and we'll pass the savings onto you! Save AT LEAST 20% off standard retail pricing when you order QuickBooks Desktop Enterprise through us. We're Intuit Solution Providers and we'll pass the savings onto you! I've created an interactive "self-directed pricing grid" for QuickBooks Online (QBO) and the desktop versions of QuickBooks Pro and Premier. Enter your specifics to see the estimated annual cost based on version, number of users, or number of company files you may need. 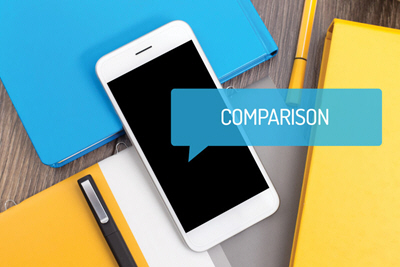 Benefits: A fast, easy way to see preliminary, comparative costs BEFORE requesting a formal quote. 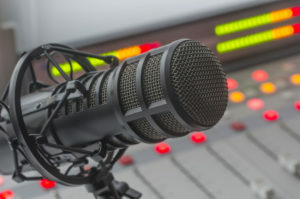 I'm honored to be included in this list of prestigious blogs! 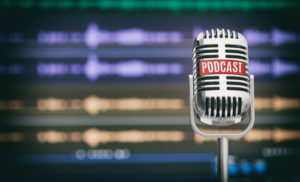 Featuring some of my most popular posts including "QuickBooks Online vs. QuickBooks Pro or Premier – Pricing & Job-Cost Features", TSheets has a long list of other resources for accountants and bookkeepers. Benefits: Access to multiple resources from top QuickBooks blog writers. Benefits: Learn the key ingredients and steps for construction companies to achieve success.